1. Look the watermelon over. You are looking for a firm, symmetrical melon that is free from bruises, cuts or dents. 2. Lift it up. The watermelon should be heavy for its size. Watermelon is 92% water, most of the weight is water. 3. Turn it over. The underside of the watermelon should have a creamy yellow spot from where it sat on the ground and ripened in the sun. The fellow in my produce department said that I should ‘spank’ it and listen for the sound. It should ‘tink‘ or sound hollow if it is right. If you hear a dull thud, pass it up. Also, you should look for an intense green rind. Darker on the outside will be richer color on the inside. 46 calories, n0 fat or cholesterol, 2 mg Sodium, 173 mg potassium, 12 grams carbohydrates, one gram of fiber and also protein, according to Self NutritionData. So it is very refreshing without running up your calories. Americans eat an average of 16.2 pounds of watermelon a year. At an average weight of 5 pounds, we eat an average of 3 watermelons apiece each year, according to the AgMarketing Resource Council. Production last year amounted to 4.1 billion pounds. This delicious food is packed with some of the most powerful antioxidants in nature, including Vitamin C, Vitamin A and Vitamin B7. These reduce the chance of colon cancer, relieve some symptoms of osteoarthritis and rheumatoid arthritis, according to The World’s Healthiest Foods. Wikipedia says that the citrulline in watermelon (especially in the rind) is a known stimulator of nitric oxide. Nitric oxide is thought to relax and expand blood vessels, much like the erectile dysfunction drug Viagra, and may even increase libido. 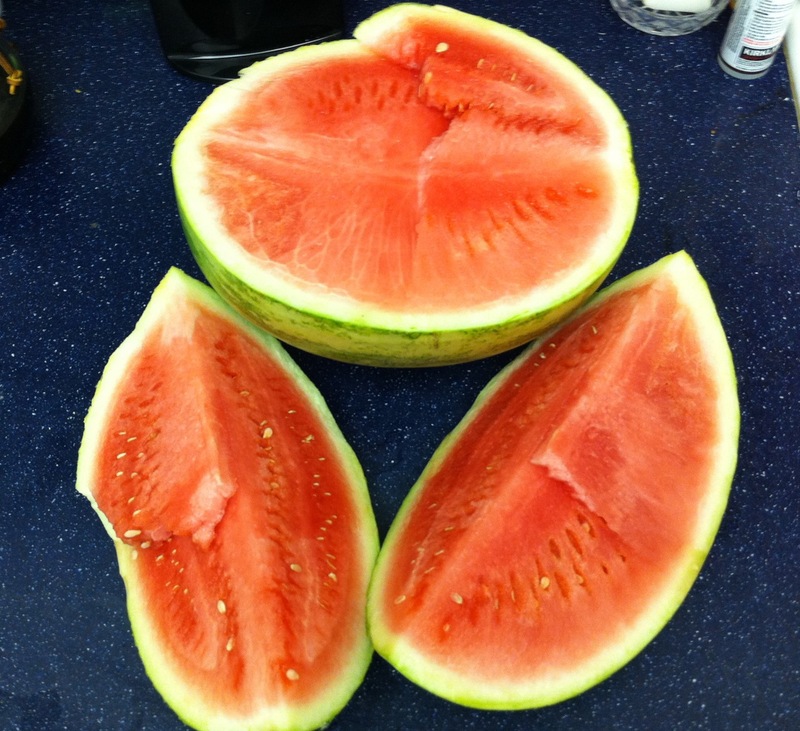 Watermelon is also a good source of thiamin, potassium and magnesium. In addition, watermelon combines with green tea to greatly reduce the risk of prostate cancer. Finally, and completely anecdotally, I consider it to be a wonderful exercise recovery food. I usually have an eighth to a quarter of a watermelon when I come back from a bike ride for an instant pick-me-up. I’m lucky in that living in Chicago, I have a market nearby that imports them from Mexico in the off season, so I eat watermelon year ’round. I had a grueling experience in the heat last summer that ended happily with some watermelon. You can read about it here. To learn more about watermelon, check out Dr. Oz on Watermelon, Drinking a Watermelon and the Vita-Mix Watermelon Sorbet Recipe also in the blog. Here is a cool You Tube link on serving a watermelon. Try it after your next tough workout. At the very least, it will taste wonderful. A party in your mouth. Because it is 92 percent water, snacking on it within an hour of bedtime is not recommended unless you don’t mind your sleep being interrupted by bathroom calls. Please take 2-1/2 minutes to enjoy the late Oscar Brown, Jr., a Chicagoan and one of my favorite entertainers, singing Watermelon Man. It is the go-to summer fruit! We tried growing watermelon a few summers ago. It was very exciting to see them grow, but sadly they weren’t as good as the ones we could buy.